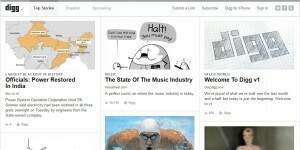 Digg,the Social bookmarking website launched the first version (v1) of its new site. It was built on fresh code base and infrastructure in six weeks. The new version requires Facebook account to login and cut down the spam. Version 1 (v1) will not include a commenting system now. The new Digg score is the sum of the number of diggs, Facebook shares and tweets for a story.